Choose a Coating | Optiforms, Inc. There are some critical steps you should consider when selecting an optical thin-film coating to maximize your optical systems’ performance. Small changes in requirements can often have a significant impact when evaluating performance and cost. Optiforms’ thin-film coatings range from anti-reflection, highly reflective, and filter coatings to various electroplated coatings on different types of substrates, including glass. Our specialty nickel-electroformed reflectors can further enhance functionality and performance. While still in the design phase, please contact Optiforms to discuss your requirements so that we can provide a solution that accurately fits your needs. Simply click the button below to open a PDF version. Addressing the question "What am I trying to accomplish?" is paramount in determining the right coatings and ensuring that the specifications of the optical system will be met, while maximizing performance and cost. In most cases, Optiforms can use this information to offer the best and most economical solution to your coating requirements. If you are unfamiliar with coating technology, our optical engineers will help select the correct coating for each specific application, whether it is a standard or custom coating design. Upon careful review of requirements, we will provide an assessment and tailored recommendations. The choice of thin-film is typically determined by the reflection or transmission requirements at a certain wavelength of light. 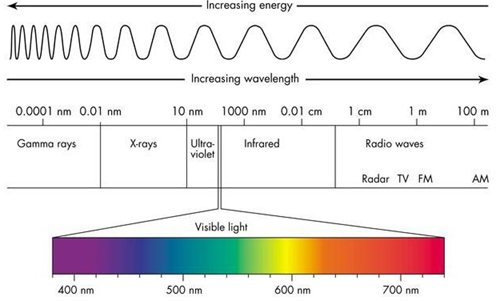 Light can be classified into three different classes within the spectrum of light: ultraviolet (UV), visible (VIS) and infrared (IR) (see Fig. 1). Figure 1. Electromagnetic Spectrum. The electromagnetic spectrum can be subdivided into different regions, based on wavelength. As wavelength increases, the energy at the wavelength decreases; energy is directly proportional to the frequency of light, and frequency is inversely proportional to wavelength. Through this correlation, blue light (wavelengths around 475 nm) are known to have greater energy than red wavelengths (wavelengths around 650 nm). Ultraviolet (UV): Spanning approximately 200-400 nm, UV is often used for curing paints, adhesives and printing ink. It is also used in a variety of therapeutic procedures, as well as in the manufacture of circuit boards. The uses for ultraviolet light are constantly expanding as technology advances. Visible (VIS): The VIS spectrum corresponds to those wavelengths that are detectable to the human eye, which is roughly from 400-700 nm. Many optical systems operate in this range including telescopes, binoculars, cameras, searchlights, movie projectors, architectural lighting, and more. Infrared (IR): IR light can be broken down into subdivisions of near, middle, and far-infrared radiation, operating in the spectral wavelength range from 700 nm to upwards of 2500 nm. IR technology is often used in the military for thermal imaging tasks, such as surveillance, tracking, and night vision. Infrared technology is also used in machine vision and spectroscopy. Hot mirrors are commonly used in many industries to redirect heat by reflecting IR radiation. Identifying the required wavelength region which is usually derived from the application, will help determine the need for a single or multilayer coating. A multilayer coating is able to perform over a greater spectrum, while a single layer is very limited in its range of wavelengths. Optical coatings are designed on the basis of interference effects, as mentioned earlier. Therefore, the performance of an optical coating relies on the reflection and transmission of light as it interacts with coating layers and the substrate. Optiforms can enhance the characteristics of reflection and transmission with its precision optical thin-film coatings. As noted, single layer and multilayer coatings operate in varying ranges of spectral wavelengths, with multilayer coatings performing over a wider spectrum. A multilayer coating can achieve nearly 10x the performance compared to a single layer, but it can also be significantly more complex than a single layer coating. Therefore, a single layer coating is simpler to manufacture and is generally less expensive. The choice of coating comes down to the performance the optical system requires. Optiforms has IRAD and spectrophotometry in-house to measure the performance of our optical thin-film coatings. We can use these measurements to optimize our coatings for the particular optical system and to guarantee the spectral performance of the coating. Angle of incidence (AOI) is the angle at which light strikes the surface of an optic; optical thin films are designed for an optimal angle of incidence. As the angle of incidence increases, peak performance is altered up to a factor of 5x and the wavelengths of the nominal design can shift to longer or shorter wavelengths. This is especially evident when different polarization states are considered, as in beam splitters, making it critical to discuss what angles will need to be optimized for the particular optical system. Vendors supplying the military with products have a strict set of quality standards that must be met for a product to meet qualifications. Military projects can cost more than standard commercial jobs because of the amount of paperwork required, testing, and extra overhead costs associated with tighter tolerances. When designing systems it is important to establish the requirements which are absolutely necessary and determine whether an element would still perform optimally with more flexible tolerances, thus minimizing the total cost of production. There are a variety of factors that need to be considered when choosing a substrate, all of which are ultimately driven by the application of the optical system. These include inherent properties of the material such as refractive index, coefficient of thermal expansion, and transmission at specific wavelength regions. Manufacturing and design parameters such as the accessibility of the material, the weight (for example, plastics tend to be used for more lightweight applications), and the ease of manufacturability are among other considerations. It is also important to note that coated high reflectors might be limited in peak reflectivity due to scatter, depending on the surface quality of the substrate. Quotations are facilitated with a drawing that calls out the size of the part, tolerances, and dimensions, so Optiforms can choose the most efficient method of production. Generally speaking, tighter tolerances are more costly because of additional complications in the manufacturing process. Optiforms thin-film coatings are very durable. However, continued exposure to humidity and extreme temperatures can alter the performance of the coating over time. Temperature changes can alter the thickness of the coating and its refractive index. Be sure to specify the operating temperature so that Optiforms can design a coating for maximum performance in that temperature range. The size of the coating run and part size can help determine the cost of thin-film coatings. Many coating houses have limited coating capacities, only focus on particular coatings, or simply do not offer technical assistance to aid in coating design. Therefore, specific coating designs and production quantities will be more suitable for particular vendors. Optiforms offers both prototype runs and high-volume production runs. In conclusion, optical coatings are carefully designed to perform under specific conditions and for required specifications, based on the application of the optical system they support. It is advantageous to work with a company with optical engineers who can understand the exact requirements of the optical system, review the thin-film coating options, and recognize the differences between capabilities and costs of various coating processes. Optiforms has a wealth of technical knowledge, expertise, and experience that can help tremendously when designing optics while providing assistance when necessary to dissect complex problems and find the best solutions.